In spite of my intentions to not write on issues involving women in ministry, I am compelled once again to do so. Sadly, the reason I am reluctant to talk about these issues is for the same reason that we must talk about them – the dismissiveness of women who speak of women in ministry as self-serving and rebellious. No, actually the dismissiveness of women. Period. I do not want to take a position with this post in terms of women’s roles in ministry. It really isn’t my intention at all to make an argument one way or the other. But I do want to ask some questions related to the greater good of the church and how we understand roles with respect to the body of Christ growing itself up together in love. Yes, let’s think about the greater good. I came across this article that recounted a touching story of a young women who took on a group of young people as disciples in her church. What makes the story even more compelling is that these were kids that apparently no one wanted to be bothered with – tattooed, socially abhorant misfits who did not seem to fit in. Yet, they wanted to learn. And they had questions about God and the bible and what constitutes a good Christian lifestyle. Sadly, the warm touch of the story turned into a striking blow as this young lady describes the command laid out to her that she must not teach because apparently the boys in the class were too old. Not only did they probably lose the only person in the church that cared enough to take them under their wing, but they eventually fell through the cracks and left the church. What was the greater good here? We can quote and dissect 1 Timothy 2:8-15 all we want, but I think honesty to the text starts with understanding the bigger picture of what Paul is trying to address. That is putting order in place so that when the church gathers in corporate worship it is able to learn. We also can’t camp out in this text but consider it in comparison to other texts and the picture of the NT church. Ascribe to male headship by all means. I do believe there is support in the text for that as a timeless principle. But does that mean it trumps discipleship at all costs? How do we translate what Paul meant by teaching and exercising authority in that 1st century context to our church structures today, keeping in mind that Paul received new revelation as part of his apostolic ministry testifying to Christ? That means something when compared to our varying leadership structures now and cultural fabric of the church. We don’t live in a 1st century context. The goal is for the body of Christ to receive instruction so they can grow together. What happens when there are gaps? What happens when we discipleship opportunities arise that no one else wants to take on and the best man for the job is a woman? Are we willing to say that women not teaching men is more important than discipleship? In situations where you have multiple structures and discipleship needs, what is the harm in a qualified woman teaching a mixed group if she is not an elder? In the case of this unfortunate story it would have meant that some kids who nobody wanted to deal received some love and instruction in Christ. Gender was more important than the gospel. And that’s a tragedy. Please hear me. The point of this post is not to advocate for women’s rights but what is best for the church. 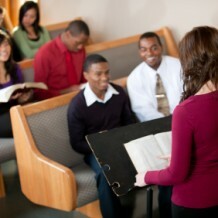 I think its great when we have our structures so neat and tidy, accommodating everybody with sound discipleship. Arrange structures with males at the church governance helm if that is your conviction (as is mine). But ministry is often messy and organic and unlike what existed in the 1st century. When situations evolve that command for godly instruction in the Word, isn’t it more important for that to go forward first and foremost? I’m pretty sure that’s what Jesus really cares about. The priority of women knowing their place over the needs of ministry, is not only unfairly dismissive to women but is really devaluing to the church. Next Article Why So Few African-Americans at Reformed Churches…and will it change? Well stated Lisa. I myself am somewhat conflicted over whether women should be allowed to pastor a church (though I lean slightly more towards them not, because I think that is what the Bible is saying). When it comes to teaching in general though, discipling those younger in the faith, and leading classes, groups, etc., I see don’t really see problem with this. The Bible doesn’t seem to address these things directly that I know of, and I do know that there were women in positions of ministry of some kind in the ancient church. When we let those who are searching and wanting to learn fall through the cracks because we are so hung up on non-essentials, everybody loses, especially those who are searching. Thanks for the comment Joe. I agree. I think the translation of 1 Timothy 2 to a contemporary context has to do with those in charge of governing the body and is not a blanket prohibition against women teaching men.